I’m on vacation, so please accept my apologies for the brief entries. — Daniel. A big thank you to farming john@Flickr, aka John Lomen of Red Lake Organic Farm, for today’s photograph. If you’re a local and you step in to the Kamloops Regional Farmers’ Market, do tell John “Hi” from all of us here at BPotD. And, don’t forget to support your local farmers! If they grow organic produce, even better! As noted by Wikipedia, radishes have been domesticated and cultivated since pre-Roman times. 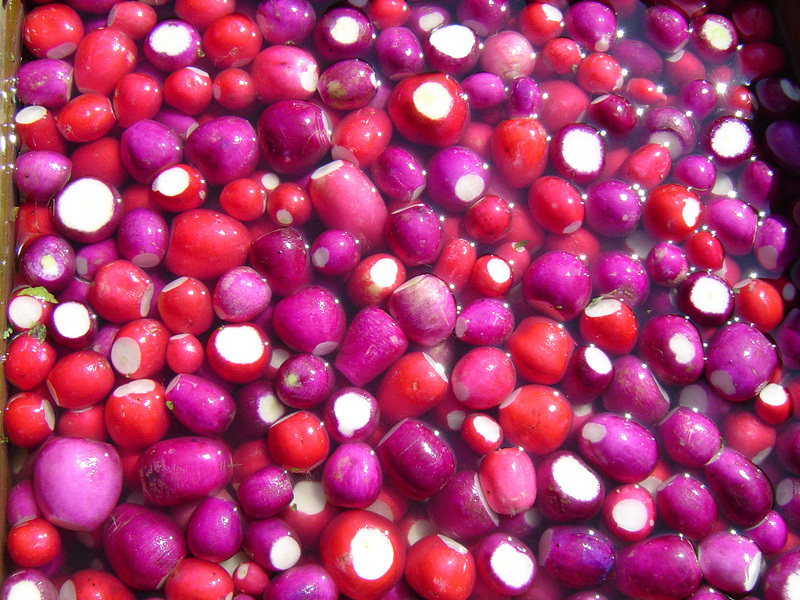 The NY Times, in “Hail the Speedy Radish, in All Its Forms” places the origin to at least 7th century BCE in China. A radish growing guide is available from Cornell University. The guide includes a list of a few cultivars; I believe one of the varieties in today’s photograph is ‘Cherry Belle’, a popular North American cultivar. i am so glad see this web again ! its beautiful! thang you very much ! i just finded this web amost yesterday , so see anytime everyday! i am living in japan, hope you wecome here and take a lot beautiful floweres ! thank you again . if i can say more english will be say more ! wonderful photo! It looks to me as if there are two distinct shades of red: one close to magenta, the other more vermilion. Are they naturally occurring in this cultivar? These are two different cultivars. They look so good. I can hear myself crunching them. The two cultivars in the photo are “Cherry Belle” and “Plum Purple”. Lovely colours. It would make a super jigsaw puzzle! Beautifull shot! Radish is one of the quikest root crops to mature. Quick and delicious!